The University of Cambridge, Monash Business School and Tsinghua University launch the 2016-2017 Asia Pacific Alternative Finance Industry Survey with the support of major industry associations across the region. The Cambridge Centre for Alternative Finance at University of Cambridge Judge Business School, Australian Centre for Financial Studies at Monash University and Tsinghua University Graduate School at Shenzhen are teaming up to launch the 2016-2017 Asia-Pacific Region Alternative Finance Industry Survey with the support of more than 20 major industry organisations across the region. This is the largest regional study to date focused on crowdfunding, peer-to-peer lending & other forms of alternative finance. From equity-based crowdfunding to peer-to-peer consumer and business lending, invoice trading to reward-based crowdfunding, these alternative financing activities are supplying credit to SMEs, providing venture capital to start-ups, offering more diverse and transparent ways for consumers to invest or borrow money, nurturing creativity, fostering innovation, generating jobs & funding worthwhile social causes across the Asia Pacific region. Opening on February 15th 2017, this benchmarking survey aims to capture the key trends, developments, size, transaction volume and growth as well as the impact of changing regulations on the alternative finance markets across Asia in 2016 – building on last year’s inaugural study. Tragically, more than 78% of Indian population cannot get a personal loan from a bank or NBFC. Why? The reason is quite simple – most banks grant personal loans to salaried employees with annual gross salary above Rs. 3 Lakhs. Some banks give personal loans only to individuals earning Rs. 6 Lakhs per annum. If an individual is NOT working at one of the big MNCs or listed companies, then it would be a difficult for him to get a loan, or worse yet, his/her interest rate would be substantially higher. The P2P lending however, works differently; it comparatively uses multiple parameters to determine credit-worthiness of borrowers. The P2P credit models traverses beyond the salary of individuals; and fortunately, it does not decline the loan application even if the borrower’s salary is considerably low. This is a guest post by an author working in the financial sector in India. Consumer Peer to Peer or P2P lending (where consumers lend and borrow from each other with the help of an intermediary) has become an important part of the financial services sector in many countries globally. Companies like Lending Club and Prosper in the US, that only started a few years ago are now worth billions of dollars. Many success stories in the west have been replicated in India, making it a belief amongst many that P2P Lending is no different. However, as proven multiple times before, a credit business isn’t the easiest to clone and depends on multiple factors including the regulatory environment, end-user mindset towards credit and intermediaries such as credit bureaus, verification, collection and recovery agencies. The Indian Banking Regulator, The Reserve Bank of India (RBI) has not regulated peer to peer lending in India. This essentially means that privileges enjoyed by similar platforms globally, namely, access and reporting back to credit bureaus (like CIBIL in India); are not available to a P2P platform in India. These have important repercussions on the performance of loans originated through these platforms and can lead to suboptimal results. For e.g. if lenders are not able to see credit reports, then they will be in an inferior position compared to banks and other financial institutions to make credit assessments. Similarly, without the loan performance being reported back to the bureau, some borrowers may not feel the pressure to re-pay their lenders. Lastly, borrowers looking to build and improve their credit rating do not benefit, as their loan performance is not reported to the credit bureaus (CIBIL). P2P microfinance service Milaap (see earlier coverage on P2P-Banking.com) raised 1.1 million US$ from Jungle Ventures (Singapore), Toivo Annus,Lionrock Capital, Jayesh Parekh and Unitus Seed Fund. The current round of funds will be utilized to expand engineering and marketing investments for enhancing the online product experience, and to invest in scaling up marketing and outreach efforts. Milaap says that so far 100% of the microfinance loans originated have been paid back. VVSSB Shankar, founder & director of i-lend, answers the questions of P2P-Banking.com. i-lend is an Internet based P2P lending platform in India which went live two months ago. Presently this service is available in Hyderabad, Andhra Pradesh. The portal connects the two sets of customers i.e. borrowers and investors who register online, undergo a verification process, list their requirements on the portal and agree for a mutually beneficial financial transaction. Tell us about how your target customers traditionally seek loans? Typically most of our borrowers have recourse to either personal loans from banks or resort to credit cards usage. These personal loans are available only to a selected segment working in some top 500 companies. Most people who are not a part of the above mentioned segment have to resort to private borrowings on which interest rates are very high more like 21 to 28%. Moreover a vast majority of urban India who otherwise are gainfully employed are denied credit for various reasons. Personal loans are also very expensive in India attracting rates between 16% – 24% by banks. Is there a reliable credit scoring model in India? CIBIL – a credit rating institution was established a few years ago and today it is the de facto body which maintains credit scores. However the credit rating eco system is evolving. What other challenges did i-lend face to introduce p2p lending in India? Before establishing a P2P model in India, it was essential that we understand the complex regulatory environment. We had ensure that we were following various laws governing the banking sector, financial institutions and other state laws with respect the money transaction. 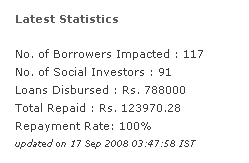 With this information, we then worked on a viable business model for P2P lending in India. We also had to modify the model such that both borrowers and investors found it attractive. For instance, i-lend does 100% physical verification of all details provided by the borrowers at both his residence and workplace reference. We also collect Post-dated cheques from borrowers for the loan tenure. – Higher returns (at least 3 times more) on idle money compared to Saving Account – The return on savings account in India is 4% while i-lend offers a minimum returns of 12% on loans given to borrowers. – A new investment option – where investors can decide whom they wish to invest in, their desired interest rate and spread their risk by investing in multiple borrowers – Min. investment amount is Rs.5,000. – Flexible loan amounts – Rs.25,000 – Rs.300,000: Banks typically offer loans from Rs.100,00 only. What interest rates do you expect to see on the marketplace? P2P microfinance service Milaap.org reports the milestone of 10 million indian rupees (approx 190,000 US$) lent in 18 months with a repayment rate of 100% so far. Good news right in time for Christmas! I just guaranteed $25 of a loan to Sakho Devi and group, Ritudih, India via Unitedprosperity.org. United Prosperity has launched on May 28th. See my earlier United Prosperity review including an interview with CEO Bhalchander Vishwanath for more information on the concept. Signing up and selecting the loan went smoothly. For the requested loan of 1,052 US$ a guarantee of 579 US$ needs to be raised. Sakho Devi has a grocery shop of her own, with which she earns her living. She has applied for a microloan to expand her small grocery shop, so that she can meet the demand from customers. The listing also states some data about the partner MFI – Ajiwika Society – it’s interest rate, delinquency rate, default rate and target clients. Indian non-profit RangDe.org attempts to bridge the gap between the developed and the developing India. To fight poverty it wants to make microcredit available to everyone at affordable rates. Individual lenders (investors) can lend as little as 1,000 Indian Rupees (approx. 21 US$). Lenders can select a borrower by browsing profiles. RangDe’s field partners receive and disburse the loan to the borrower, which pays a fixed interest rate of 8.5%, of which the field partner receives 5% and the lender receives 3.5%. Lenders need an Indian bank account to participate. According to their blog, RangDe evolved over the past 7 months and launched the current version of the website in August. RangDe aims to finance itself by generating advertising revenues.